Inside: Are you asking yourself "What to do the first day back from winter break in Spanish class?" 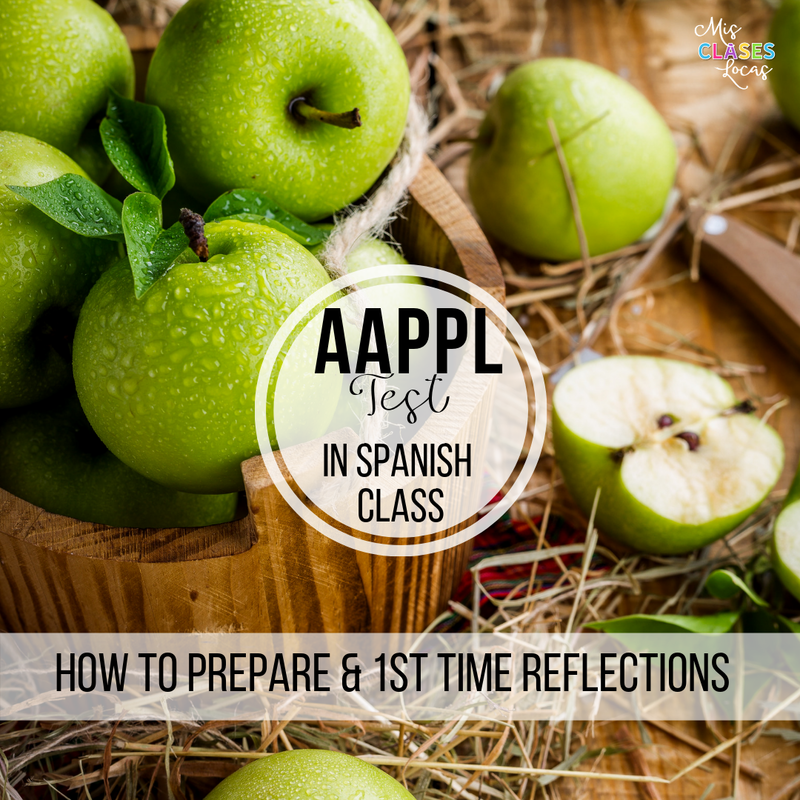 Here are my no prep plans for the first day of school in the new year for all levels of Spanish class. Happy New Year amig@s! I hope you have enjoyed your break. I spent quality time with my little family and enjoyed some much needed rest. We are back at school on Wednesday the 2nd and have students on Thursday the 3rd. With that strange two day week, my plan is to ease into the new year talking about what students are dying to discuss, their break! To make things easy on myself and to have a work free break, I already have my first week back plans on my desk with copies made. Similar to my first day of school plan, I am adapting the same basic activity across all levels. If you are looking for a idea of something that you can adapt for all levels you teach, check out my plans below. (Or here is a full week of 1st week plans from two years ago). In Spanish, welcome students back and show them a couple pictures of my break, describing it in Spanish. Give students a couple minutes to brainstorm something they did over the break (and write it if they would like). During this time I will write some common phrases on the board as an example. I know even in a couple weeks they lose confidence and I do not want to put students on the spot. Discuss a few volunteers answers, circling and repeating the high frequency phrases. Pass out different versions of the find someone who sheet, depending on class. (All of the versions discussed are included). Spanish 1 will actually be using my new version just focusing of fue this year. I decided to try and ease them in with just one verb in past. 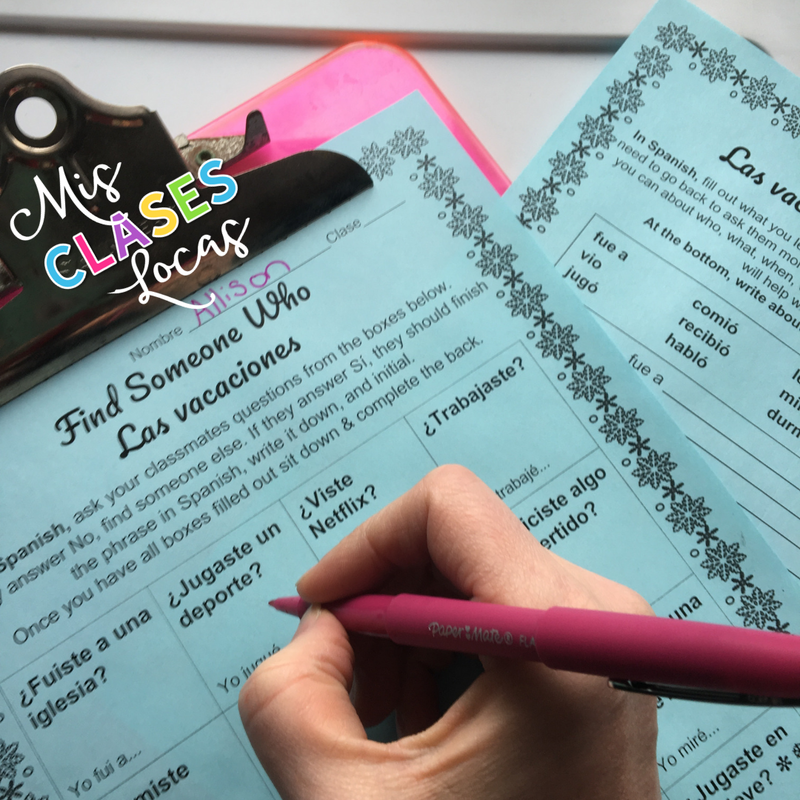 Or if you want to use versions of the same holiday break FSW in all classes, you could use the easiest version with the yo form listed to answer on the front, and the s/he form listed on the back to later talk about their classmates. 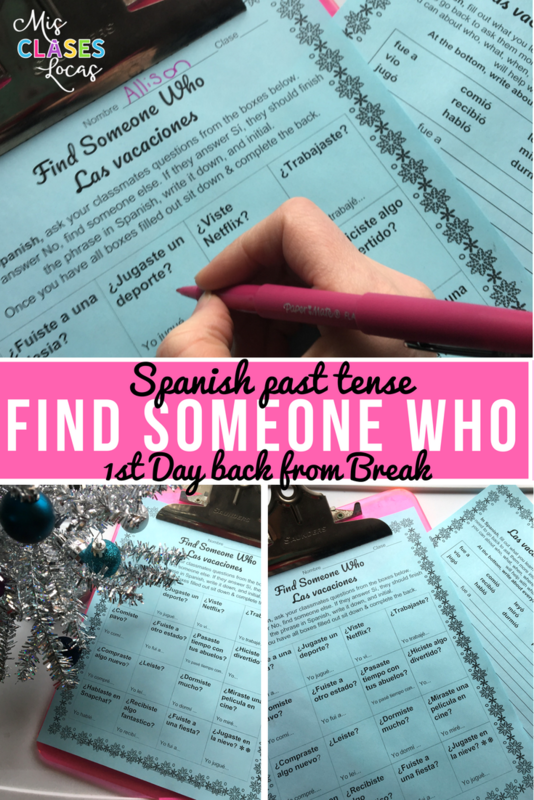 Spanish 2 will use the holiday break FSW with the yo form listed, as to help with confidence using the correct yo form in past tense, and a word bank of possible s/he forms on the back. Spanish 3 will use the holiday break FSW with the least support and will come up with the yo and s/he forms on their own. Before setting them lose, students will get a chance to look through the possible questions and make sure they know what everything is asking. We will clarify as needed, so once the activity starts, it can be in all Spanish. 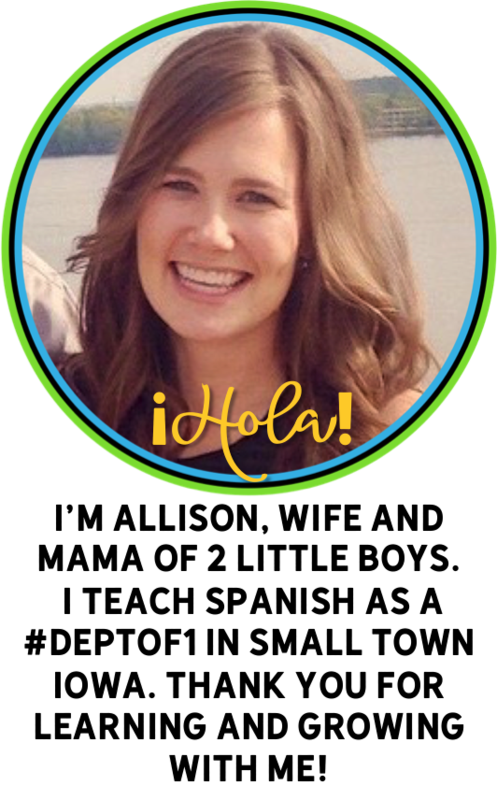 With a clipboard, sheet and pencil, students will go around asking each other the questions in Spanish. They will add in elaborating details and sign each others' sheets. Once they have all squares signed, students will practice the s/he forms by writing about what their class did. Depending on the class, you can see above how much assistance they get with the writing. All students will also write about what they did. Depending on the class and interest I may pick a couple extensions. These would probably happen the next day depending on time. Discuss as a class who did what. Make a giant Venn Diagram comparing and contrasting students, or the teacher and a student. (This would be a good way to add in the plural forms). Have students draw what a classmate did. Put these up around the room or project with a document camera and guess who the picture is describing. Have students draw what they did. These could be used to have them describe to each other in Spanish or have the teacher use them to describe what they did. Play 2 Truths and a Lie (students write two things they actually did and one lie. The teacher then reads these and the class guesses who it was and what their lie was). Do a free write where students write what they did and what a classmate did. If you like the idea of a people hunt for your first day back but would rather focus on the present or imperfect tenses, please see these two resources below or see all versions here. Find Someone Who - Super 7 - imperfect - perfect for those who completed the Super 7 special person unit in imperfect or just want to talk about childhood. Here's to an amazing 2019! 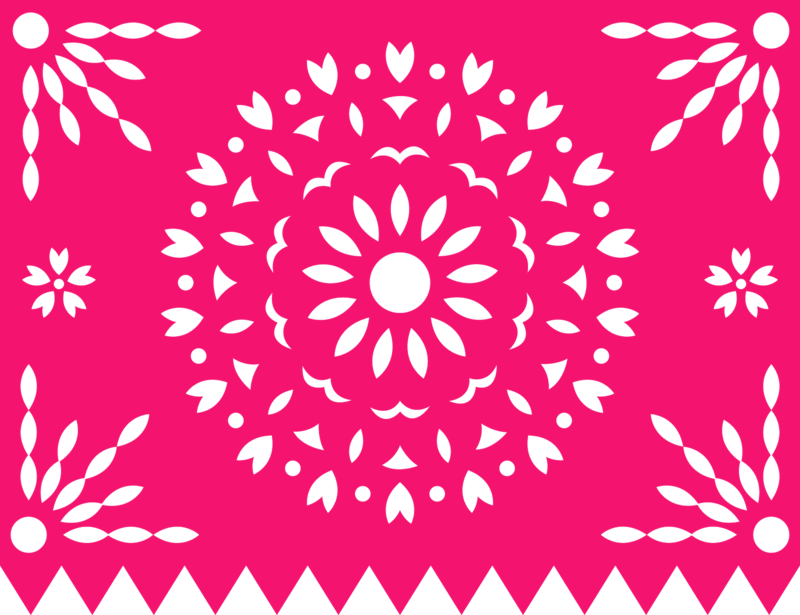 Gracias! I am also going to have my classes make New Year's resolutions for themselves and their families, using "ir a" or the future tense, depending on the level. Great idea! I might be borrowing that one! This is also what I do the first week back of Q3! I plan to discuss our S1 final and our grades and then go into personal and academic resolutions. (Emphasis on Ir + A + Inf and Tener + que + inf.). I use the resource from "El año nuevo" section from sparkenthusiasm (also of TPT). Then we do a chalkboard splash to compare what our priorities are and then we come up with a class resolution according to our common goals. Right after Vday, we do a mid check point to see how on track we are and revisit our goals. It’s no secret that most men only want one thing, right? Well it turns out that’s not only wrong, but may actually be the root of many failed relationships. Is actually a feeling he’s been chasing his whole life. It’s an elusive combination of emotion and biological drive that’s rarely satisfied in life or love. And he will pursue your love to the ends of the earth.